When we first moved into our house, our stairs from the basement up to the main living area looked like this. Not completely terrible, I guess, but I had bigger dreams for them. Back when we walked through this house during our house hunt, we had tried to carefully peak under the carpet on the stairs to see if there was hardwood underneath. We couldn’t really get a good look though and so we assumed it was just going to be plywood. 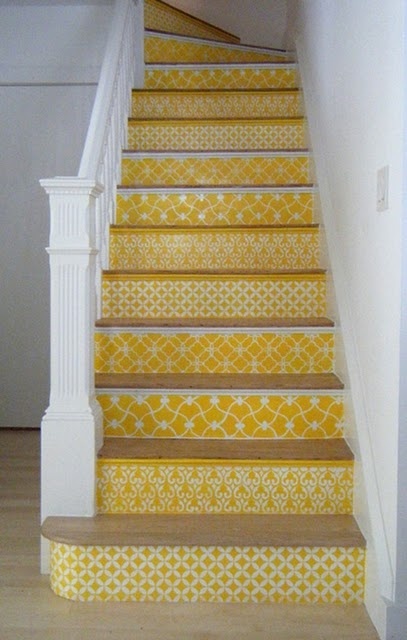 I told Tim that eventually I would want to rip up the carpet on the stairs and paint them or do something pinteresting to them. One of the first things I did after we moved in was paint the hand rails white, but other than that, a stair makeover ranked pretty low on the priority list. Then a few weeks ago, I was cleaning up some broken glass in the basement near the bottom of the stairs with the vacuum cleaner (after a vase had an unfortunate incident with a boy and a soccer ball) and I noticed that the stairs were way overdue for a good vacuum. As I was down there sucking up dog hair with the vacuum cleaner hose, I decided to pull back some carpet and really get a good look at what was underneath. And much to my surprise and delight there were finished hardwoods under the carpet! 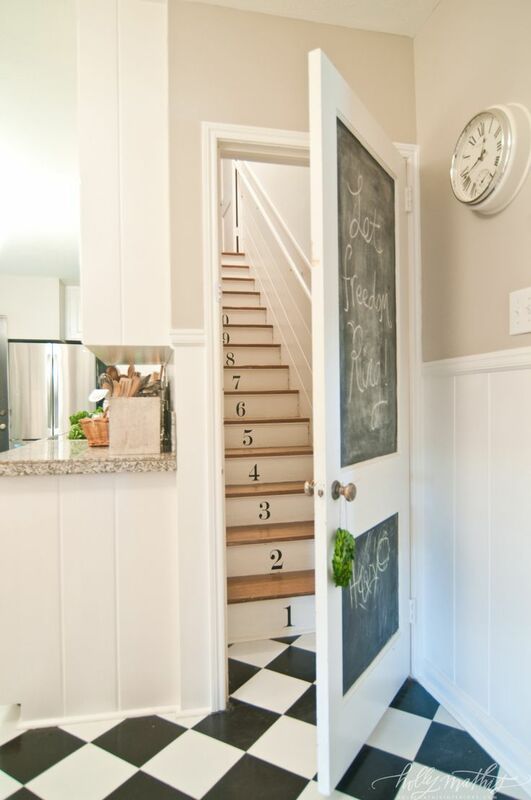 I am not much of a planner when it comes to household projects. I am a doer. When the urge hits me, I just start and then I figure it out as I go. Sometimes this works out well and other times (like with the kitchen linoleum floors) it doesn’t. But either way, it’s typically how I do things, so less than ten minutes later, I was ripping that carpet off the stairs (with a little help from the kiddos). Why do people cover hardwoods with carpet? It baffles me. Removing carpet is a big job, with lots of nails and staples involved and one that’s probably better done without little kids around. But if I waited for that to happen, I’d never get anything done, so I just do it and consider it part of their home education. 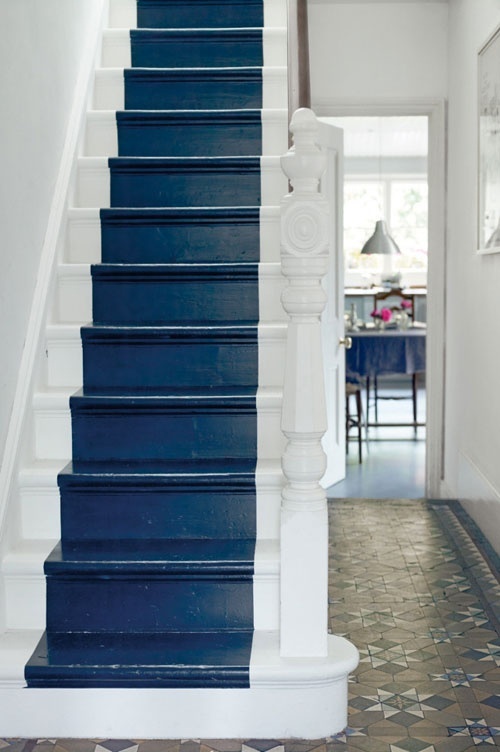 Eventually the stairs looked like this. Granted, they still needed some work, but it was already an upgrade in my opinion and it was free. I spent the next few days searching Pinterest for ideas and thinking about what I wanted to do to them. In the end, I decided to paint the risers white and put numbers on the stairs. My inspiration came from this picture below. I had pinned it months ago and I was still very much in love with it. Instead of sanding them, I wiped them down with Klean-Strip Easy Liquid Sander DeGlosser. And then after priming and painting the risers (two coats of each), it was time to put numbers on them. I looked for stencils, but couldn’t find any that I liked, so I settled for printing out the numbers in the font I liked and then I used tracing/transfer paper to trace the numbers on the risers. I also made sure to measure and center each number on the riser. It was a slow, tedious process for sure. Originally, I planned to paint the numbers black, but since I didn’t have any black paint on hand (and didn’t want to load up three kids to go buy any), I decided to use a color that we already had, Whispering Spring by Benjamin Moore. 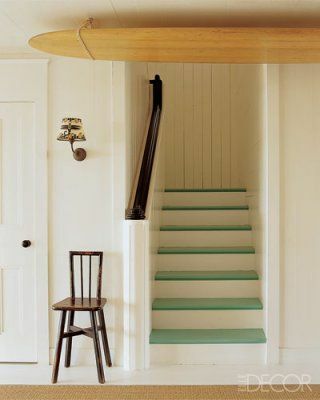 I decided I liked that idea better anyway because it kind of gave the stairs an old beachy, cottagey feel, which I love. Wow! You always do such a great job! I've been meaning to comment on other posts as well but my time is rediculously limited lately ( finishing school and vbs planning ) obviously not blogging! Haha! I was so touched and really related to your post on marriage. And I just want u to know how much I enjoy your little blog. I don't read too many and my goodness some can be so fakish ( and I say that really trying not to judge :) ) I know we'd be friends in real life! Have a beautiful day!